Our Annual General Meeting was held on December 7th in the GAA hall. There was a great turn out with many topics being discussed. The current Lotto Jackpot is €7,000 and growing! Weekly tickets can be purchased in different businesses in Kenmare town. You can also play online by visiting our Kenmare Shamrocks GAA Facebook page and clicking on the blue ‘Play Game’ button. If you prefer to buy an Annual ticket that automatically includes you in 52 weekly draws (7 of which are free), please contact a member of the committee or call 086 2265164. Annual tickets are €90 each and remember If you’re not in, you can’t win! The club ran a Christmas Bazaar last month at Fr Breen Park, with a huge attendance of both young and not so young! Everybody who attended enjoyed themselves and why wouldn’t they? Santa and Mrs Clause turned up to greet the kids and double check on their Christmas lists, our Kerry footballer Stephen, Seanie, James and Dan ran coaching drills for our budding stars. The Wheel of Fortune kept everybody on their toes with some amazing prises and there was also hot food, drinks buns and cakes and Xmas trees on offer. We are hoping for a bigger and better Bazaar in 2019 so please come out and support it, and ee would like to say a big thank you to the committee who organised this great Day and for all the volunteers who helped in making it so successful. Kenmare Shamrocks GAA Club member registration is now open ONLINE for 2019 season. Just go to the Kenmare Shamrocks webpage on www.clubforce.com and fill in the details. Our club registration day will be announced shortly. 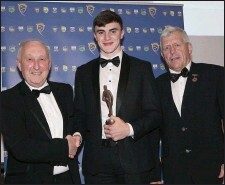 Finally, we would like to congratulate our club player Sean O’ Shea on being awarded Munster Senior Footballer of the year 2018. Fantastic achievement!